For years, telephone and cable companies have claimed there is little demand for better networks because they cannot identify a single "killer app" that needs 100Mbps or 1Gbps. Recently, I've heard from kindred spirits saying that the "killer app" is the network itself. This is a smart response. Imagine someone demanding we dismantle the Interstates unless we can identify a single use that makes them worthy. The proposition is absurd. There are thousands of ways the Interstates are used. Some -- like ensuring the military can move about the country quickly -- are quite important whereas others are important only to a few people (as when my family goes on vacation). We are all better off because we have such a robust transportation system. Our markets are more efficient and we have greater freedom of movement. We all also bear the cost (whether it be through taxes, pollution, or other impacts … and yes, we bear that cost unevenly). Roads have been essential infrastructure for centuries -- few argue they should only be built where those along the path can pay for the full cost of doing so. Access to the Internet is rapidly becoming as important as the roads have long been. Whether for economic development, education, health, or quality of life, a lack of fast, reliable, and affordable access to the Internet diminishes all. For years, rural cooperatives have built telecommunications networks in rural areas where no private company would dare invest. Joan Engebretson explains why "Broadband Payback is not Just About Subscriber Revenues.". The upshot is that in doing a cost/ benefit analysis on telecom infrastructure investment, it’s important to take into account not only the direct revenues that the infrastructure generates but also the dollars that flow into a community as a result of the investment. 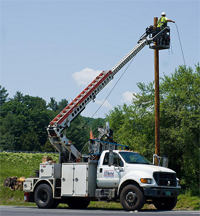 The East Central Vermont Community Fiber Network has announced it will connect an entire town as its second phase. Barnard, Vermont, will be the first town to have universal access to ECFiber's next-generation network. Phase 1, with construction under way (see photo) and scheduled to go live in early August, brings an ultra-high-speed fiber loop from the ECFiber central office near I89 Exit 3, along VT Routes 107 and 12, to the center of Barnard. ECFiber expects to begin connecting businesses and residents who live on this route in early August and will provide detailed subscriber information closer to that date. At its June meeting, the ECFiber Governing Board authorized an initiative to extend service to the rest of Barnard town. This requires a second round of capital-raising through a similar "friends and families" offering directed specifically to residents, businesses, and others who wish to support the deployment of universal broadband in Barnard. Loredo Sola, ECF Governing Board Chair commented, "When we first took our plan to Barnard, we were inundated with residents offering to pay the entire cost of extending the Phase 1 trunk to their homes. This enthusiastic response inspired us to authorize a Barnard-only fund drive." ECFiber will be organizing informational meetings for Barnard residents and businesses to explain the details of the plan. When sufficient funds have been committed to build out the entire town, the Barnard Local Fund will close, and construction of Phase 2 can begin. Barnard had 94% of the community presubscribe! The success of ECFiber comes without any support of the state, which has continued to pretend wireless connections and out-of-state corporations will provide the networks necessary for the economic development needed by communities. Like many Washington Public Utility Districts, Pend Orielle, has connect small portions of its electric territory with an open access fiber-to-the-home. But these projects have been difficult to finance in remote (and often mountainous) areas. Pend Oreille previously built a pilot project but is now expanding its network with a stimulus grant from the feds. The project will make highspeed Internet available to approximately 3,200 households, 360 business, and 24 community anchor institutions such as schools, libraries, and health care facilities. Residents and business owners will have the opportunity to subscribe to a variety of highspeed Internet services through local internet service providers. Public interest advocates in the telecom arena have long been frustrated with a parade of large, powerful non-profit organizations blindly supporting the positions of powerful telecom companies that just happen to make large donations to those non-profits. A story this week confirmed the worst of our suppositions: these groups often have little idea of what they are supporting. The Gay & Lesbian Alliance Against Defamation seemed pretty enthused about the AT&T T-Mobile takeover a few weeks ago. Odd for GLAAD to be excited about its constituency paying higher prices for wireless services, but whatever. Until a few days ago, when we got a look behind the scenes -- AT&T wrote their statement and it was simply signed by the organization's President -- who apparently had no idea what it was about. But he knew that AT&T gives big money to the org. He has since resigned. Around the time that we learned of the GLAAD shenanigans, we learned how super excited Cattle Ranchers are for the AT&T takeover of T-Mobile. There is absolutely no evidence to suggest this merger will do anything for rural residents but increase the prices they pay. There is no shortage of spectrum in rural areas so T-Mobile offers nothing AT&T cannot do on its own. And while the Cattle Ranchers are clamoring for higher monthly prices from AT&T, the single best hope for rapidly expanding wireless broadband access in rural areas - the unlicensed white spaces - is being quietly killed. Ironic, ain't it? I have long supported the efforts of the Media Action Grassroots, which works to organize and educate people about essential issues in telecom and media. They work with real people and represent real people's interests all the time, not just when it doesn't conflict with a big donor. We need to support organizations that support our values, particularly when it is inconvenient to do so. nDanville, the open access fiber-optic network operated by the City's public power company, has been quietly succeeding in southern Virginia. This network has already connected half of the communities health care facilities, allowing them to improve medical care with 100Mbps and gigabit circuits at affordable prices. The medical network connects Danville Regional Medical Center and about half of the area’s medical facilities to nDanville, a fiber optic network established by the city. The high performance fiber allows real-time access to patient medical records and allows for the exchange of CT and MRI scans instantly. "It enables us to better serve our patients by having their information available across multiple sites," Deaton [CEO of Danville Regional Medical Center] said. "We will continue to support the city's efforts in linking our medical community together, and I want to commend the city for the success of this network and making healthcare a top priority." On average, fiber connections for these facilities provide twice the bandwidth of the previous connection but at a 30% savings. More than 90% of the medical facilities (approximately 125 locations) are to be connected by December 2011, said Jason Grey, the Broadband Network Manager of Danville Utilities, who led Danville’s charge to become a recognized intelligent community by ICF.